Wooooooooooot! 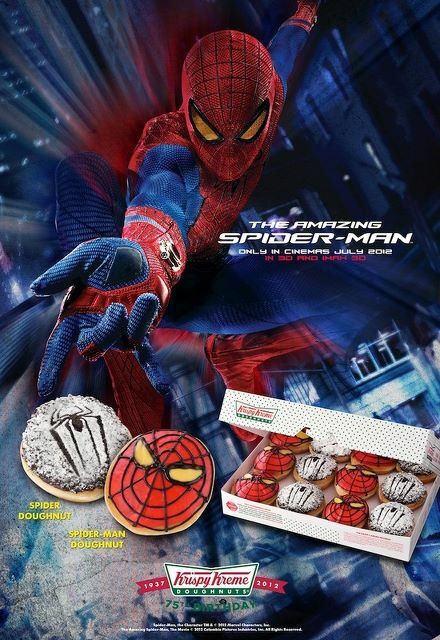 My favorite superhero Spiderman has now a thrilling Krispy Kreme Donut version! How I wish Krispy Kreme would send me some of this! Ha ha ha! Go on and get tangled in the sticky web of the Spider-Man mania as Krispy Kreme rolls out its latest thrilling addictions—the Spider and Spider-Man Doughnuts. Feed your fixation with the world-famous, melt-in-your-mouth doughnuts, which Krispy Kreme puts an epic spin to; one filled with chocolate kreme rolled in carat chocolate and crushed Oreo cookies then dusted with a Spider-outlined coating, and another charged with strawberry filling and coated with Spider-Man’s face using vanilla-colored icing and satin iced candy. Available this June 1 to July 15, these latest additions to Krispy Kreme’s line of premium products allows everyone to enjoy the amazing blast of the Spider-Man mania through two treats. To further pack a punch to the craze, get a Spider-Man non-woven bag when you purchase a Dozen Assorted with both of these filled doughnuts. Be sure to grab one, both, or a box at a Krispy Kreme store near you and add sweetness to that sticky fixation!